On September 11, 2001 (or, as it came to be known, 9-11), I was sitting in my second grade classroom. I vividly remember my teacher getting a phone call, then ushering my class into the neighboring classroom with their students and teacher. The TV was on and both teachers struggled to keep it together. I was one of the younger kids, having just turned 7 years old. I remember not really knowing what was going on, just knowing that a plane flew into an important building in NYC. Some of the my fellow students were crying. One girl was frantically trying to call her mom, who was supposed to be flying that day. I remember my teacher telling us “things are about to change”. Things did change, and they changed pretty fast. A war started, taking many soldiers from my hometown with it. Some, sadly, never made it home. 9-11 was the day things started becoming scary. People began making bomb threats to my elementary school fairly regularly. I started having nightmares that some sort of terrible attack would happen in my hometown. I had my first panic attack in the spring of 2002 as a result of a “lockdown” drill at my school. We had to start making plans for what would happen if our city became a target. “What if?” became the norm, and feeling safe became a luxury for a long time. The entire time these things were going on, I still didn’t have a clear understanding of what was happening politically. The “adults” never really told us kids what 9-11 (and its repercussions) meant. Most of the information that we got came from glimpses of the news, and what was coming from the news was pretty morbid. The magnitude of 9-11 didn’t sink in until a few years ago. I was 19 years old, visiting NYC for the first time. The 9-11 Memorial and Museum had recently opened and my mother, sister, and I went to visit it. The first thing you see when you walk in to the museum is this big, mangled fire truck. As you make your way through the exhibit, you hear audio bites of phone calls from the planes, watch clips from the news that day, and see pieces of the Towers themselves. Walking through the exhibit, the extremity of 9-11 finally clicked. Thousands of innocent people had lost their lives. These people were people like me, who were just trying to travel somewhere. They were people like some of my friends, who became EMTs to selflessly help others. They were people like my dad, who thought they were just going into the office for the day. Most of all, they were Americans. Today, I, like many others, mourn the loss of these Americans from this terrorist attack. I also mourn for the thousands of innocent lives lost abroad in a war that I’m still trying to understand. I mourn for my generation, with childhoods scarred by terrorist actions and war. Mostly, I mourn for those who lost their loved ones, with wounds opened fresh each year around this day. Today, we all hold our loved ones a little tighter, thankful that we still have them. 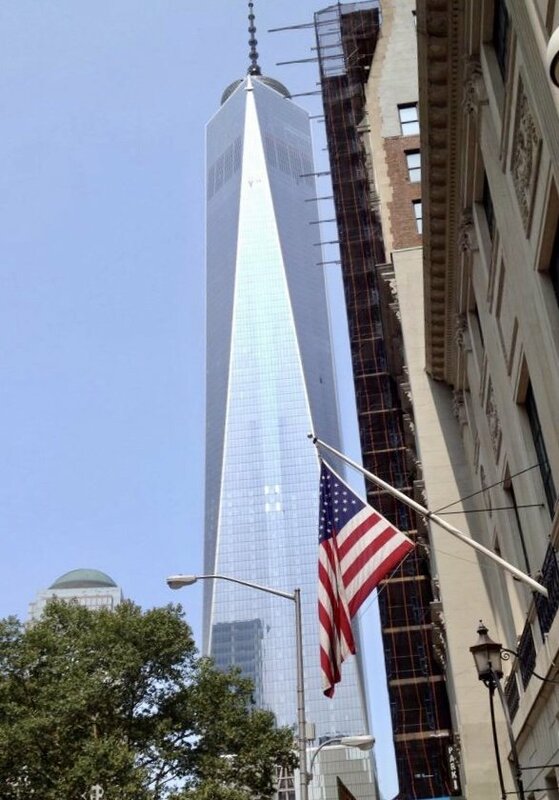 Today, One World Trade Center stands tall, a reminder of the resilience of Americans. Were you alive during 9-11? If you feel comfortable, please share your experience – where you were, how you felt, etc – in the comments below. This was beautifully written. 9-11 was the day the world changed and not for the better, I remember being in secondary school when it happened. As children we didn’t understand the horror of the event at the time but everyone was silent, watching things on the news, hearing the towers had fallen. Terrorist attack – a phrase soncommonly used these days but back then I don’t think I’d ever heard them before.